So... the main problem with the Radeon is that it requires also a 3.3V line to operate which the Amiga PSU doesn't deliver. Putting an ATX Power Supply into the Amiga, and then feeding Radeon with the 3.3V line from the ATX PSU that Amiga doesn't use. 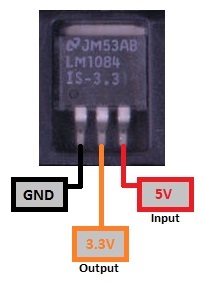 Using an LM1084 3.3 regulator that you can feed with a max voltage of 27V as input (5V from Amiga are just fine to produce less heat) and ouput the required 3.3V. So... this is the ATI Radeon of mine in which I have marked the spots on the PCB where you can get the Input (5V), Output (3.3V) and GND lines. Since regulator is getting a bit hot, I decided not to let it stay naked but instead I thought of putting a dedicated transistor heatsink. Since my regulator was a PCB version without a hole for a screw, and because the heatsink was a bit big for my taste, I dremeled it and attached the regulator using a thermal paste glue! This is how it looks in my Amiga's last available PCI slot (Slot 0). Well done! Very clever indeed - Regards. Very good job my friend, i couldnt setup mine on Mediator although it was recognised in pciinfo. Bought same Card modded it like you showed works perfect with the full 256mb. Maybe a stupid question but how do I know where to put the voltage regulator on a different 9250 card?